With the season now over, teams are facing an offseason filled with golf rounds and hot-stove strategy. But we're not going to let them get off that easy. No sir. No way. In an attempt to bring some closure between franchise and follower, we're giving a blogger from each team the opportunity to give a concession speech for this year's squad. Up next is our old pal Ian Casselberry,a former Stewie who's now a featured columnist at Bleacher Report. He wrote the 10 best things about being a Tigers fan earlier this year. Thank you. Thank you. Please... thank you. All right. Thank you. 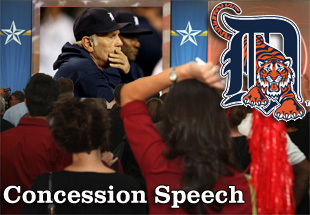 People of Detroit, people of Tiger Town — I know this is the speech you were hoping you wouldn't have to hear. I certainly hoped I wouldn't have to make it. I know some of you are still stunned by what happened in the World Series. There was so much promise, so much excitement after the Detroit Tigers swept the New York Yankees in the ALCS. Anything seemed possible after that. Certainly, the first World Series championship in Detroit since 1984 seemed possible. However, I ask that you remember how special it was just to make it to the World Series. No, we were not just happy to be there. And being swept by the San Francisco Giants was a tremendous disappointment. But hope is still alive, Tiger Town. Let that warm your heart during a cold winter. Mistakes were made: Remember how many times you doubted whether this team would even make the playoffs, Tiger Town? On June 9, the Tigers were six games behind the Chicago White Sox in the AL Central. After losing to those White Sox on Sept. 17, Detroit was three games out of first place. It was a dark time. Oh, it was dark. Many of you were ready to give up and fully embrace football season. How did this team think it could get by with Delmon Young in its lineup? With the likes of Quintin Berry, Andy Dirks and Avisail Garcia playing in the corner outfield spots? How did the Tigers bullpen become so bad, so fast? 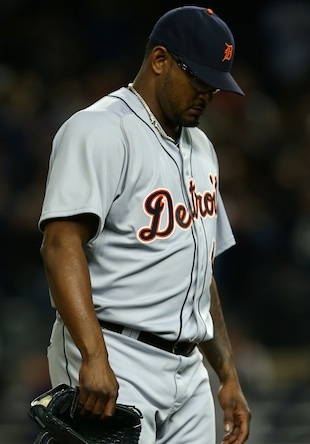 Jose Valverde saved 49 games last season without blowing an opportunity. By the World Series, the only thing manager Jim Leyland would let Valverde close was the bullpen door — after another reliever ran out to the mound. How did a lineup featuring Miguel Cabrera, baseball's first Triple Crown winner in 45 years, and Prince Fielder become so feeble against the Giants' pitching? Yes, those pitchers deserve credit. But how did it become so easy for them? What happened to Jhonny Peralta and Alex Avila, who were All-Stars a year ago? How did Berry — the worst of the 18 players who took the field in the World Series — become a starting left fielder for this team? Mudslinging time: General manager Dave Dombrowski did his usual fine work at the trade deadline, picking up the second baseman that the Tigers so desperately needed in acquiring Omar Infante from the Miami Marlins. That deal also included Anibal Sanchez, a crucial fourth starting pitcher. The Tigers made one of the flashiest signings of the offseason in signing Prince Fielder, but Dombrowski's failures to address other flaws on the roster hung over this team deep into the regular season. Detroit never found a left fielder, nor an extra right-handed bat. Before getting Infante, the Tigers used Ryan Raburn, Ramon Santiago, Danny Worth and Brandon Inge at second base. It took Leyland and Dombrowski too long to realize that none of those players was a solution. The Tigers pinned their hopes on too many questionable players — Young, Raburn, Inge, Berry —hoping they would succeed. There were just too many holes to fill during the season. Only so much could be done at the trade deadline. More needed to be done during the winter, when a team is really built. Though it may be easier to say in hindsight, this team also needed another good reliever. Joaquin Benoit's playoff ERA was a respectable 3.38, but his tendency to give up long fly balls made him a shaky proposition. Octavio Dotel and Al Alburquerque were fine. Phil Coke was a postseason surprise. 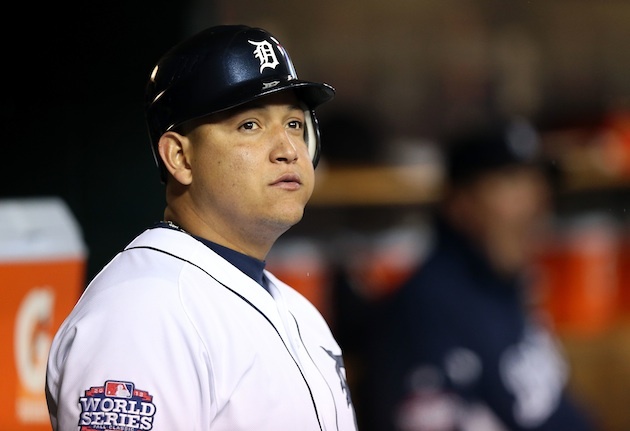 But Valverde's postseason failures essentially left the Tigers with a 24-man playoff roster. And the bullpen didn't have the depth to cover for him. The holes in the outfield and the bullpen cannot be left to linger into next season and perhaps patched up at the trade deadline. They must be addressed definitively during the offseason. Hope for the future: Yes, the World Series sweep hurts, Tigers fans. Like many of you, I've been curled up under a blanket in a dark room for days, wondering how such a wonderful season ended so quickly and unexpectedly. But it's time to look ahead to next season. Don't look directly at the future, however, because it is bright. Wear sunglasses at the very least! The Tigers have already announced that Valverde and Young will not be back next year, which means there will be improvement at closer and designated hitter. The team's new closer may be an in-house hire. Perhaps the guy will be top reliever prospect Bruce Rondon, who rocketed from Class A ball to Triple-A Toledo this year. He struck out 63 batters in 55 innings, while racking up 29 saves. Victor Martinez returns to the lineup after missing all of 2012 with a torn ACL. He's a rock of consistency, bringing a .300 average, 20 home runs and 100 RBIs to the DH spot. A middle of the order with Cabrera, Fielder and Martinez will be one of the best in baseball and help the Tigers to avoid the scoring droughts that plagued the team throughout the season — and especially in the World Series. A change is going to come: This team knows it squandered a significant opportunity in losing to the Giants. Trips to the World Series cannot be taken for granted. So many things have to go right to get in position to win a championship. But the Tigers will not rest on their laurels. The front office knows the roster has to be improved and can't go into next season with major questions in the outfield and bullpen. And do not underestimate the desire of an 83-year-old owner who wants to win a World Series. Mike Ilitch will keep pouring money into his baseball team, which could result in a move no one expected, as with the Fielder signing last winter. That hole in the outfield may end up being filled with a major surprise, even if it's a player Dombrowski might not have envisioned as a fit. That could be true for the bullpen too, though the free-agent options aren't plentiful. If Ilitch wants a guy, he has shown he will spend whatever it takes to get him and goose Dombrowski into doing what's necessary to make it happen. Fellow Tigers fans, the pain of defeat will pass. The sting of embarrassment will abate. As a famous district attorney once said, the night is darkest just before the dawn. That dawn is coming. This team will nurse its wounds and come back stronger, like its ferocious namesake beast. The Tigers will roar again and that shout will reverberate throughout the jungle of the American League next season. Justin Verlander's arm, Miguel Cabrera's bat and Prince Fielder's hefty dreadlocks will make the competition tremble! Thank you! Thank you, my friends. Get strong this winter. But stay hungry. And may Kaline bless Tiger Town!